Legions of soldiers come together in a grassy field, forming splintered lines across from one another. Athletes adorned in distinctive insignia upon colorful clothing clutch swords, bows, spears, and axes. A shout is heard and controlled chaos ensues. The sound of steel crashing against steel fills the air. This is not the legendary Battle of Hastings, pitting great forces of English and Norman kingdoms against each other in a fight for power. This is not the year 1066. This contest takes place in 2013 in a field in California, Toronto or near the original battle site in East Sussex, England, and ends in smiles and stories for the banquet halls. Men and women of all ages are becoming warriors of the 21st century through medieval combat reenactments. As time separates us from the Middle Ages with each passing year, dedicated reenactors keep history alive through small- and large-scale retellings of the historic battles across Europe and Russia. 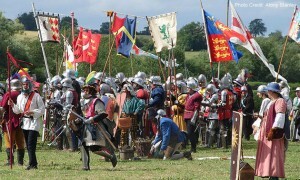 With a focus on authenticity, they share firsthand views of civil and military life ranging from 500-1600 A.D. A popular component of these retellings takes place on the battlefield where contributors are lauded not only for painstaking accuracy in their equipment and fighting styles, but also technical skill and physical superiority. 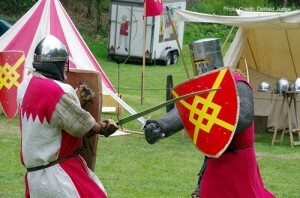 One nonprofit corporation headquartered in Milpitas, Calif., the Society for Creative Anachronism, oversees these reenactment tournaments and festivals that feature heavy combat, fencing and archery, among other disciplines. With differing physical requirements, each sport demands a unique training regimen although combatants with little or no training are welcomed to join and begin perfecting their craft. For heavy combat, something that may take place in one-on-one, five-on-five or large group competitions, the combined weight of armor and weapons requires considerable strength in the legs, shoulders and upper arms. While roaming a battlefield in 50 pounds or more of armor is difficult enough, the added stress of continuous thrusts and parries presents a problem without the proper amount of strength. Especially late in the battle, the skill of accurately wielding a weapon is not only important for earning victory but also keeping the competition safe for yourself and competitors. Lower body strength ensures warriors maintain their balance while absorbing strong blows from opponents. Losing footing may be the difference between a victorious bout and bitter defeat. For those very serious about shaping up for a competition, a full-body, high-intensity workout like CrossFit is a viable option. While the heavy combat competitions sometimes last less than a minute and focus on anaerobic training, fencing requires deft movements and bouts may carry on much longer. A training regimen focused on speed and agility is important as fencers are constantly reacting to opponents’ attacks and movement. Combined with quick feet, a long reach acquired through great flexibility enhances the effectiveness of potentially “fatal” thrusts. Leg-strengthening exercises such as straight-leg raises, squats and wall sits keep the lower body, especially the knees, fresh to avoid injury during repetitive lunging motions. If you’d like to experience the living history in person, reenactment groups can be found in nearly every state across the U.S. Or if you’re feeling especially adventurous, start designing your medieval heraldry, get moving and join the battle yourself.